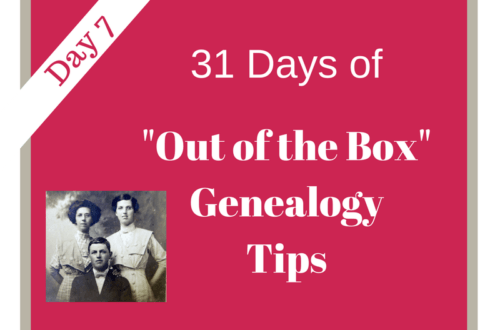 31 Days of "Out of the Box" Genealogy Tips - Cemetery Research | Are You My Cousin? 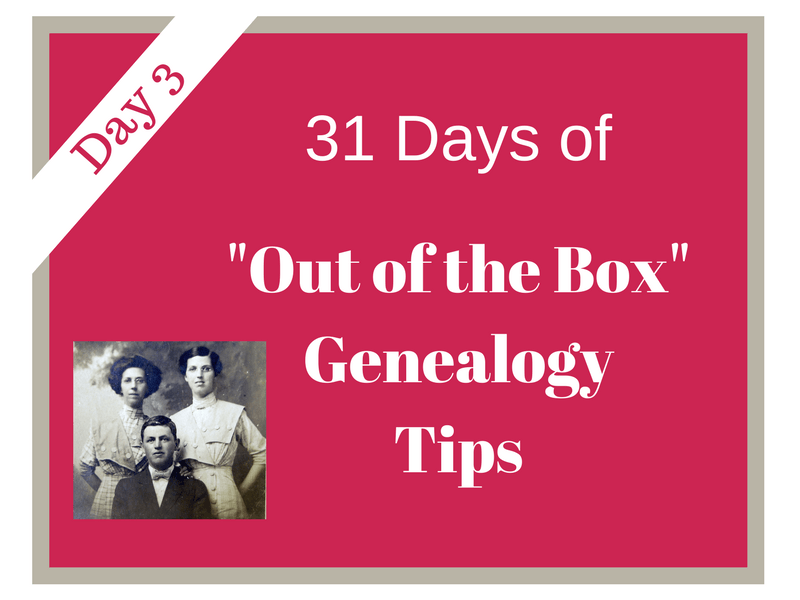 Welcome to Day 3 of the 31 Days of “Out of the Box” Genealogy Tips series! Need to start at the beginning of the series or catch up? Start here. 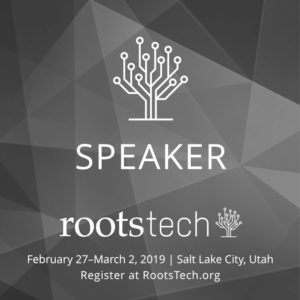 DAY 3 – Let’s Talk Cemetery Research! Once you find where your ancestor is buried, don’t just stop there. 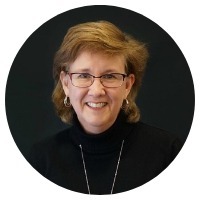 Expand your cemetery research beyond just the location of your ancestor’s grave and/or a photograph of the tombstone. Carefully consider WHERE they are buried. Where your ancestors are buried can tell you much about them and their lives. You can also learn who was important to them. Is your ancestor buried in a church cemetery? Then your ancestors was likely a part of a faith community. 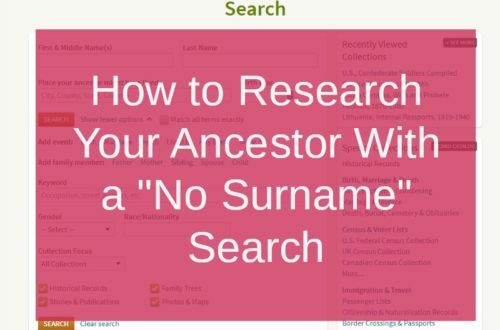 Explore those religious records for clues to your ancestor and collateral ancestors. Was your ancestor buried in a family cemetery? Then consider where that family cemetery is located. That land was very likely a part of family land at one time. Explore the land records for further evidence of you ancestor(s). Next consider WHO is buried close to your ancestor? Often our ancestors were buried close to spouses, children or even in-laws. 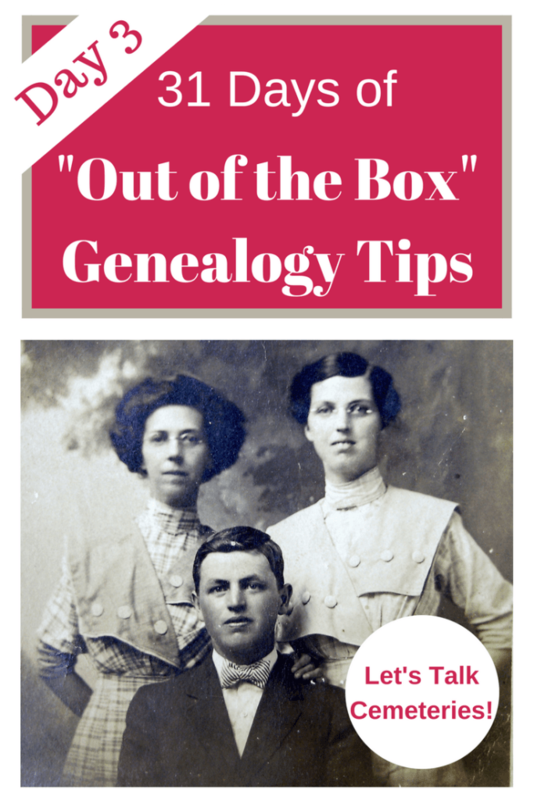 Learn the names of the individuals buried close to your ancestor AND learn their relationship to your ancestor. 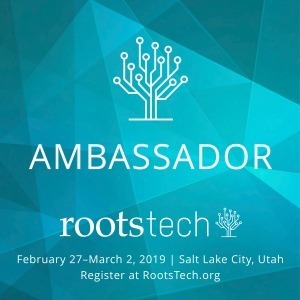 You might well discover more of your ancestors and connections you have not previously identified. Learn more about evaluating a family cemetery here. Talk to the cemetery office (if one is available). Records kept by the sexton or cemetery office may have more information on your ancestor’s burial. Include a stop by the office or include a phone call as part of your cemetery research. These are important tips that many of us don’t consider. 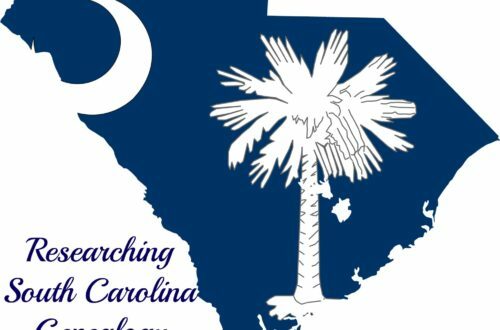 I am currently working via email with a woman in CA whose ancestor was born in NC, but eventually died in FL in 1873. His last years were spent as an LDS elder, he is buried in an cemetery apparently owned by another prominent local LDS elder and the tombstone has the only listing of his parents’ names that she can find. We are currently exploring how to access LDS records for clues based on the information provided in that cemetery. Hopefully there is a reliable clue to support the tombstone engraving.